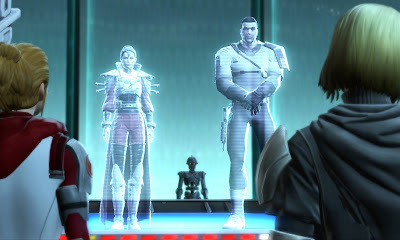 At last, the War for Iokath has begun! I was very excited when I jumped into the update with my pet tank last night. I already mentioned it in my post about looking forward to the patch, but this is the first time in literally years that we could get into the meat of an update together instead of just jumping into our separate solo stories. Sure, there were still solo cut scenes, but at least we could group up in-between. 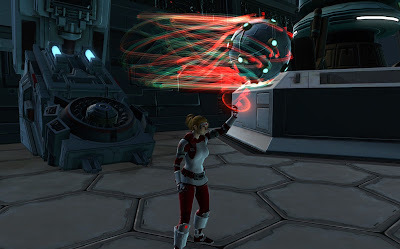 We had such fun romping around Iokath and exploring it together; it was great. Also, I got to play with giant balls - always a plus in my book. I couldn't help but think though that Bioware seems to be somewhat out of practice in terms of making things work flawlessly in groups. I remember first thinking that back on Ziost, where one of the daily quests initially bugged out big time if you were in a group, and again during 4.0, where in certain Star Fortress cut scenes any people you were grouped with would suddenly disappear. (Pet tank and I joked that he put me in his pocket on the way out.) It's easy to take things working in a group for granted, but it seems to me that a bit of expertise has been lost in that area and has yet to be recovered. On Iokath this first showed itself when we went to the terminal to pick a side for the dailies and I was told I was "not eligible for this conversation". We soon found out that this was because my pet tank had already clicked on it beforehand, and because he had already chosen a side, I was somehow not allowed to pick one while grouped with him. Easily solved by disbanding the group, using the terminal and regrouping afterwards, but still strange. I'm guessing this is in place to avoid people picking different sides and then essentially being grouped with the "opposite faction" but it didn't feel very intuitive. The biggest blunder however happened when we were doing a story mission in parallel in our own separate phases, finished it, and when it progressed to the next stage I suddenly got ejected from my own phase and ended up spectating in my pet tank's instead. It was amusing more than anything (I got to make snarky comments about his dialogue choices), but still not something that should really happen. There was also at least one daily quest that could have easily been put in a group phase but was put in a personal phase for no reason I could make out, which was again somewhat annoying. We all know that "chasing after the superweapon" is a well-worn Star Wars trope and mostly serves as an excuse to reignite the Republic-Empire conflict here, but it's not done with a lot of heart. Everyone's chasing after the MacGuffin, but it initially doesn't even have a name and nobody knows what it does (thus the ridiculous overuse of the word "superweapon"), which makes it a bit hard to understand why everyone's quite so gung-ho about it. When I think back to other big-name threats in the storyline, such as the Barrager or the Gauntlet, we at least knew why these things were a big deal. Here, not really. So I could see players who value the story above all else being a bit disappointed by this update, even if there was an interesting twist at the end. 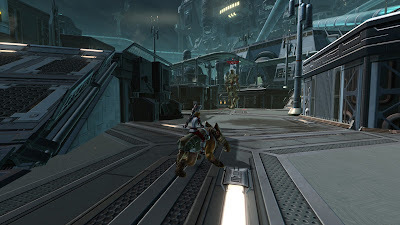 For me however, anything it was lacking in this department was easily made up for by the fun of actually running across Iokath with my pet tank, searching for daily objectives together and discovering things like strange teleporters or glitched-out champion droids (I still don't know what was up with that one). What else could I add to these first impressions? Oh yeah, one of the first quests has you running around a contested area where Republic and Empire are fighting and the mobs actually come in big and hard-hitting groups. I pulled too much and had to run away at one point; it was exciting to even have to do that! "Giant balls" sounds like something right out of a Simpsons episode. 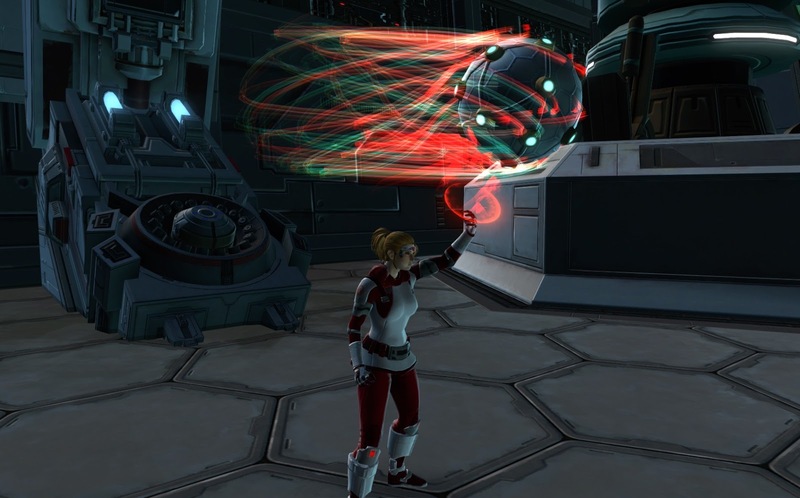 Those balls seemed far smaller when handled by a male BT3 Guardian. Half-hearted was exactly my impression, as well. It felt like the scenarists were ticking off a checklist. MacGuffin exists, check. Disable/reenable the Eternal Fleet, check. 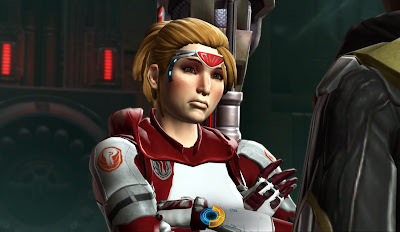 Remind us of Iokath's technorealm feel through a few gimmicky droid fights, check. Barely consequential moral choice, check. Family drama (by now a SW:TOR requirement), check. Acina and Jace are completely interchangeable, despite being vastly different characters. As are Dorne and Quinn, who have really been short-changed in their much-fanfared reintroduction. None of it is bad, exactly, but you really get the feeling that they mailed it in. There was no writerly love for this material. Yeah, ticking off a checklist is another good way of describing it. 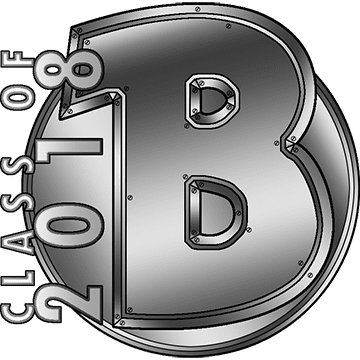 All the ingredients for greatness are there (I don't consider the use of the superweapon cliché a problem by itself), but they just aren't brought together in a very exciting way.